Camp Shoshanim wishes Susie Fishbein a huge MAZAL TOV on receiving the Harry S. Feller award at the NJY Camps Gala. Last night all of the Gala attendees had the privilege of hearing Susie talk about the Susie Fishbein and Friends Culinary Institute and watch her give a cooking demonstration. 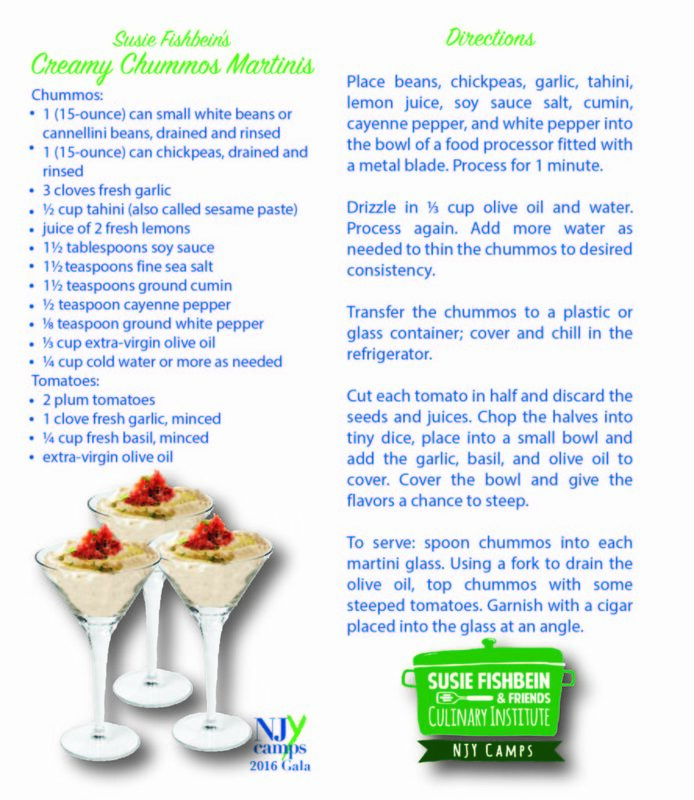 Everyone learned how to make Creamy Chummos with Steeped Tomato Martinis, and were given samples to taste. Missed the gala? Have fun preparing the chummos with Susie’s recipe below. Our campers love learning new skills and techniques from Susie. Listen to our campers and staff talk about the Culinary Institute and watch the learning that happens in the Institute. Check out this video to see the Culinary Institute in action!